See more for this region. This video examines the impacts of fresh water flowing into the Arctic Ocean from ice and rivers on thermohaline circulation using advanced, specifically-designed engineering. Scientists profiled are from Woods Hole Oceanographic Institute and other research institutes. Good background information and references given in the accompanying lesson plan: http://www.windows2universe.org/teacher_resources/leaky_gyre.html. 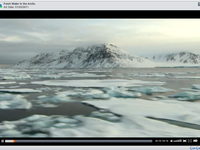 Comments from expert scientist: The video presents a very nice summary of fresh water changes in the Arctic and their impacts. It is very clear and the language is at a level that students of at middle school and above level should be able to understand. It highlights a concept that is not discussed as much in the Arctic (e.g., sea ice, Greenland), but it is very important. The graphics are well done and informative. It is also nice to see the "process" shown - i.e., the buoys and the instruments - as opposed to just the data and conclusions. The main concern is that it looks a bit out of date. The most recent data shown is 2010, which is now 7 years ago. I think newer data indicates some changes in the freshwater trends that are shown. It is still valuable because of the solid theoretical science information provided and the presentation of the observation methods. But it would benefit if it was presented paired with more recent data, if such data is available. The video outlines the issues of fresh water flowing into the Arctic Sea and the challenges that scientists face collecting data there. Teachers should be aware (and pass on to students) that climate change will have different impacts in different parts of the world and that it won't be "warming" everywhere. Video quality is not ideal; video may be pixelated at larger viewing sizes. MS-ESS2.C1:Water continually cycles among land, ocean, and atmosphere via transpiration, evaporation, condensation and crystallization, and precipitation, as well as downhill flows on land. MS-ESS2.C2:The complex patterns of the changes and the movement of water in the atmosphere, determined by winds, landforms, and ocean temperatures and currents, are major determinants of local weather patterns. MS-ESS2.C3:Global movements of water and its changes in form are propelled by sunlight and gravity. MS-ESS2.C4:Variations in density due to variations in temperature and salinity drive a global pattern of interconnected ocean currents. MS-ESS2.D1:Weather and climate are influenced by interactions involving sunlight, the ocean, the atmosphere, ice, landforms, and living things. These interactions vary with latitude, altitude, and local and regional geography, all of which can affect oceanic and atmospheric flow patterns. HS-ESS2.A1:Earth’s systems, being dynamic and interacting, cause feedback effects that can increase or decrease the original changes. HS-ESS2.C1:The abundance of liquid water on Earth’s surface and its unique combination of physical and chemical properties are central to the planet’s dynamics. These properties include water’s exceptional capacity to absorb, store, and release large amounts of energy, transmit sunlight, expand upon freezing, dissolve and transport materials, and lower the viscosities and melting points of rocks. HS-ESS2.D1:The foundation for Earth’s global climate systems is the electromagnetic radiation from the sun, as well as its reflection, absorption, storage, and redistribution among the atmosphere, ocean, and land systems, and this energy’s re-radiation into space.